Wellbeing is completely personal. Wellbeing programs should be too. Engage employees every day with a comprehensive wellbeing solution that promotes healthy minds, bodies, and wallets. Reach employees before they make care decisions, and guide them to the highest quality, lowest cost options. Identify employees with conditions that require extra attention, and seamlessly guide them to the programs and benefits they need. 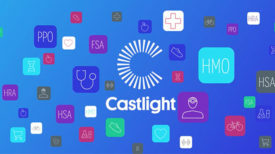 Make it easy for your customers and clients to navigate healthcare by becoming a Castlight partner. Our health navigation platform is flexible, modular, and future-proof. We have three distinct solutions that address the top benefits challenges faced by employers. Improve employee wellbeing and satisfaction with benefits. Increase utilization of the benefits tools and resources you’ve chosen for your employees. Guide employees towards high-value benefits and reduce unnecessary care.